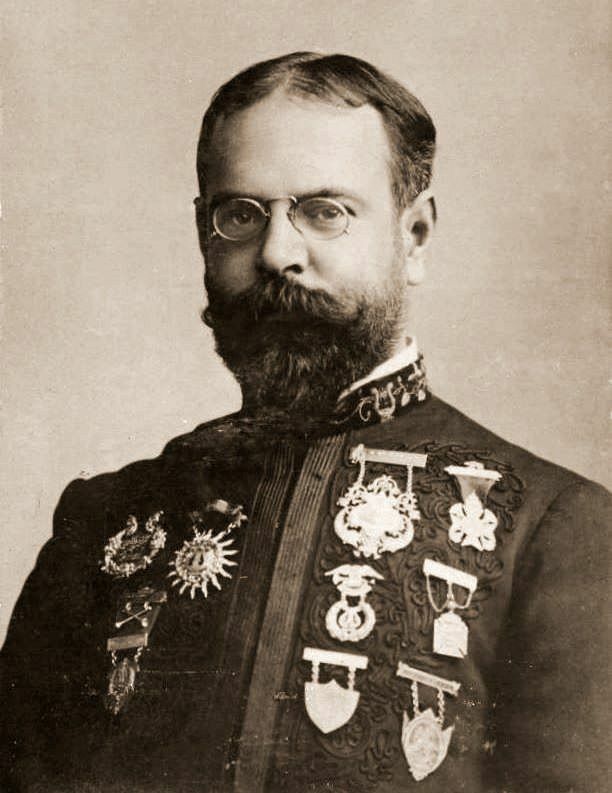 Today in Masonic History John Philip Sousa was born in 1854. John Philip Sousa was an American composer and band leader. Sousa was born on November 6th, 1854 in Washington D.C. At the age of six, he began learning music by starting with the violin. It was determined that Sousa had absolute pitch. He would go on to study voice, piano, flute, cornet, baritone horn, trombone and alto horn in addition to the violin. At the age of 13, his father enlisted him in the United States Marine Corps as an apprentice musician to prevent Sousa from running away and joining a circus band. After his apprenticeship was over, Sousa joined a theatrical or pit orchestra where he learned to conduct. In 1880 he returned to the Marine Corps band in 1880 and remained as it's conductor until 1892. It was during this time that Sousa composed many of his famous marches. Under Sousa the Marine Corps band was recorded by the Colombia Phonograph Company. Sousa did not like the new recording industry and often made disparaging remarks about the music that was available. He referred to it as "canned music" a play on a quote by Mark Twain. The reference was to the cylinders that the beeswax recordings came in. In 1892, Sousa requested a discharge from the Marine Corps to pursue a civilian career in music. Sousa led the "the President's Own" band under five presidents. He also played at the inauguration of James Garfield and Benjamin Harrison. In 1893, Sousa directed J.W. Pepper to create the sousaphone, a marching brass instrument. Sousa wanted a tuba that could be heard upward and over the band even if the player was seated. In 1898 it was redesigned by C.G. Conn. The redesign was the instrument that Sousa preferred to use. In 1917, Sousa was commissioned as an officer in the Unite States Naval Reserve. He was 62 at the time which was the mandatory retirement age for Naval officers. During the war he led the Navy band at Great Lakes Naval station. By this time Sousa was a wealthy man. He donated his entire salary each month, minus a token $1, to the Sailors' and Marines' Relief Fund. He was discharged from active duty in 1918. He remained in the reserves though and in the 1920's was promoted to lieutenant commander. On March 6th, 1932 Sousa passed away in Sands Point, New York from heart failure. He had just conducted a rehearsal with the Ringgold Band. Sousa was a member of Hiram Lodge No. 10 in Washington D.C.